Share "How to Help With Your Pet's Shedding"
Shedding is a natural, healthy way cats and dogs renew their fur, but loose fur is not always welcome to pet owners – particularly when it seems to get everywhere and into everything. Pets need thick winter coats and need to shed them in spring, but pet owners who need less fur in their lives can help control their pet's shedding in a variety of ways. Good Brushing: The fastest, simplest way to reduce shedding is with good, regular brushing. Use the proper type of brush for your pet's coat texture and length, and brush them at least 3-4 times a week when the shedding is worst. Daily brushing is best and will continually remove loose, broken or damaged hair as well as distribute natural oils to keep your pet's coat in peak condition. Regular Baths: Bathing your pet once a month will help remove dirt and debris that can damage fur and cause extra shedding, and loose hair will easily come out in the bath. Use pet-formulated shampoos for the best results that are gentlest to your pet, and opt for a pet-friendly conditioner to keep fur supple and strong to minimize shedding. Good Nutrition: A high-quality, balanced diet rich in protein will keep your pet's fur in top shape and reduce shedding from brittle, loose hair. Adding a teaspoon of flaxseed oil or olive oil to your pet's food once a day will provide good Omega-3 vitamins to improve their coat. Skin Care: If skin is dry, itchy or irritated, pets will scratch more and pull more fur out for shedding. Consult a veterinarian for a skin evaluation, and adjust your pet's diet to meet their nutritional needs for strong, healthy, supple skin. Pets with severe allergies or fleas will also itch more and therefore shed more, so controlling those conditions is essential for good skin care and less shedding. Proper Hydration: If a pet is dehydrated, their fur will be more brittle and will break and fall out more easily. Always provide your cats and dogs with adequate fresh, clean drinking water, and add wet food to their diet to increase their hydration. Flavor your pet's water with a bit of low-sodium broth to encourage them to drink more. Clean Up: Shedding is a natural part of a pet's life, and while it can be minimized, it cannot be eliminated. Use smooth throw blankets to cover furniture and wash the blankets frequently when your pet is shedding more, and vacuum regularly to collect loose fur before it is ingrained in upholstery, carpets and drapes. If your pet shows signs of irregular, excessive shedding, such as losing clumps of fur, developing bald patches, or showing skin rashes or sores, see your vet immediately to check for more serious skin conditions and health issues. Taking care of your pet means letting the fur fly during shedding season, but savvy pet owners know they don't have to live in a fur ball! 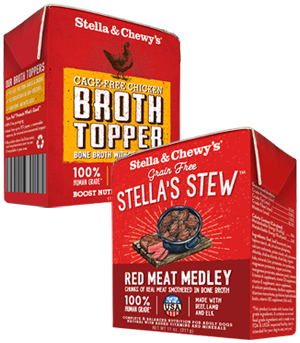 Get a free Stella & Chewy's Stew or Broth when you purchase two! Not valid with any other discounts or sales. 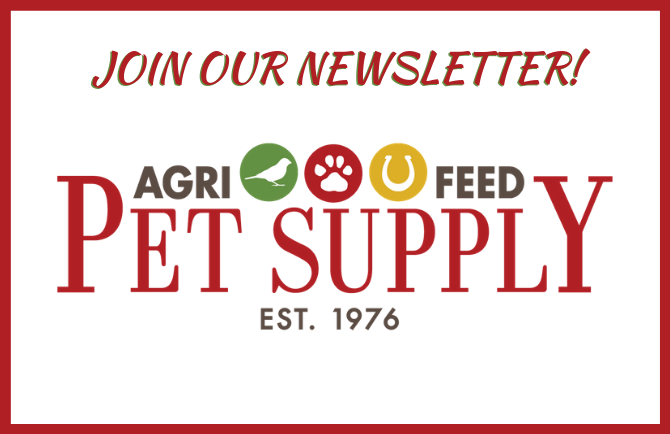 Established in 1976, Agri Feed Pet Supply is the area's largest, locally-owned and operated pet supply store. You can trust the expertise in our helpful employees, who genuinely care about the health, happiness and well-being of animals. Big or small, furry, finned or feathered; we have plenty of food, healthy snacks, toys and accessories for your pet. Our gift gallery is chock full of ideas for the pet lover on your list. And, our pond and aquatic experts will keep your fish happy, too. © 2019 Agri Feed Pet Supply. All rights reserved.